Home Valley are delighted to introduce this top quality. 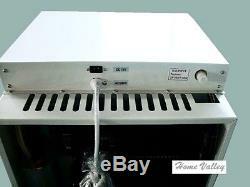 Carvin 43Liter 3-Way Absorption Refrigerator. 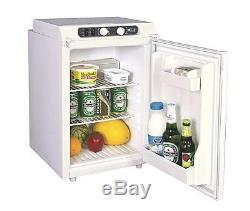 Home Valley is the main distributor of 43L Carvin Absorption Fridge in the UK. 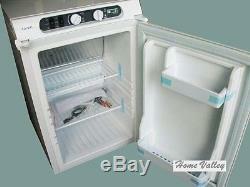 Type: Leisure 3 Way Fridge 12V, 220240V and Gas. Suitable for the use in your caravan or motorhome or at camping. Whether operating on electric or gas, this fridge is not suitable for use in boats. Conforms to current EMC and electrical safety regulations. Isolation: Cyclo-pentane, totally CFC free. Gas Type: Butane and Propane. 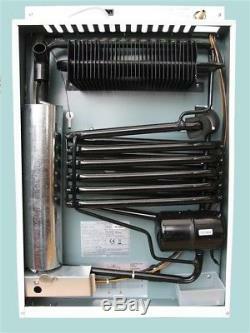 Gas Input Pressure: 28-30/37 mbar. 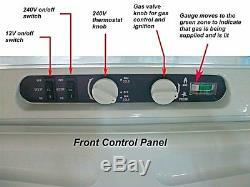 Front panel control on both gas and electric. Gas valve incorporates safety pilot and piezo ignition. Fridge comes with right-hand thread for gas connection. Thermostat for temperature control when operating on electric. High gas and low gas function when operating on gas. Very well ventilation would be required at the back of the fridge. Dimensions: 400 wide x 470 deep x 620 high mm (approx). 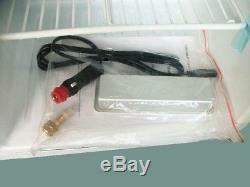 Comes with UK plug, 12V lead and gas adapter. 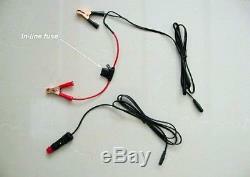 Two types of 12V lead (see large picture below). Crocodile clips cable with in-line fuse. Door: Right-hand side door hinges. Fridge has no freezer compartment. Net Weight: 19.5 kg. 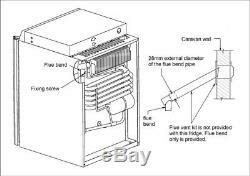 Flue vent kit is not provided with this fridge. Flue bend only is provided. 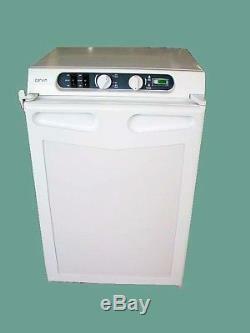 This is a fantastic 3-Way Absorption Refrigerator at an. Deliveries to all Islands and to the post codes shown below carry additional costs. Please check with Home Valley. AB31-38 AB40-56 IV1-28 IV30-32 IV36-49 IV51-56 IV63. (PA20-38 PA41-49 PA60-78 PH4-44 PH49-50 KA27-28 HS ZE BT). (Channel Islands, Isle of Man, Isle of Wight, Isle Sily). 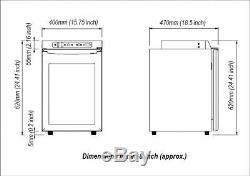 The item "Caravan Motorhome Leisure 3 Way Absorption fridge 43 Litre New White" is in sale since Sunday, July 02, 2017. This item is in the category "Vehicle Parts & Accessories\Motorhome Parts & Accessories\Caravan Parts\Mobile/ Touring Caravan Parts". The seller is "home_valley" and is located in York. This item can be shipped to United Kingdom, Ireland.